Club Penguin Cheats by Mimo777 Club Penguin Cheats by Mimo777: Club Penguin Limited Edition Easter Bunny! Sweet! 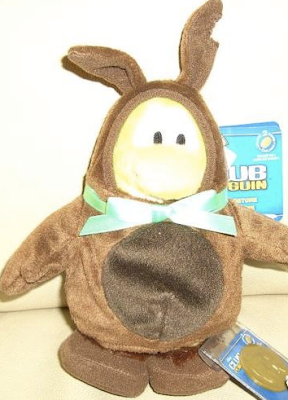 Check out the new Club Penguin Easter Bunny costume plush toy! He looks like a chocolate bunny with a bite taken out of one ear! You can check out all Club Penguin toys here. I might accidentally think it's food. Lol. I just found out the white puffle's room will be the mine!!! check it out, there's its box!! It's a coin code. You enter it on clubpenguin and you can get some pretty cool stuff! That is a coin code. you can enter it to get some cool items and coins on CP! Yup! that has been there since all of the other boxes have! The label on the side is a coin code. It is sooper cool because you can get rare stuff on club penguin with it! me too i get hungry for choclate bunnys !!!!!! kewl. Yummy. Man i want chocolate. Cool I wish I could get a toy that looked like me I would love it! It is a coin... if you enter the code on the coin.. you will be able to unlock an item from the treasure book! Yep, you are right! Good Observation! im watching the 2010 olympics and canada (my country woooot!!!) got 2nd in the women's mogul thingy. they were soooo close 2 getting 1st! anyway, thats a very cute stuffy! i kinda wanna eat it! actually it looks like the face is made out of marzipan or something! modding time! Awesome! For my birthday I got the Rad Scientist!!! Happy Chinese New Year! Year of the tiger! Woot! You guys gonna go to any parties? Have You seen the boxes? A coin code. Use it to unlock items online! Yup! He already posted this. It's a coin code, you enter the code on clubpenguin. Ok mimo... when i logged on i went straight to igloo to the box portal and my computer is kinda slow but anyway before i went to the box dimension (then it froze) but i saw the newspaper had NEW on it and i thought they stopped doing that... is it a glitch? That is a coin code. You can log it in to CP to unlock free items! Lol, I'm hooked on you! Weird, but I luv chocolate. I didn't get any. Wait! GASP! My dad usually always gets this chocolate, Esther Price, for my mom for Valentine's Day! Oooh, Dad is so busted! Well, they brought back the "New!" sign. So, it's not a glitch! Good job on finding that Fluffygood! Oh, almost forgot about that! To think that Chinese Olympic participants have to spend their next about a week in Vancouver! YES! I totally want to get it. But I haven't been able to get many CP toys lately, and I've got a sixmonth cp membership so i pretty much have lots of stuff... but still, i want it anywayz! It looks so cute! I really, REALLY want a series six, but i think i'll wait until just after series 7 comes out so i can see which is better. YAYZORZ! Cool! Man, I really can't wait for that puffle party! Yeah, Mo talked about that on CPG already. Isn't it awesome? Now there might be two puffles that came out on puffle parties! mmm..chocolate bunny..wha? why am I dreaming of chocolate bunnies? its supposed to be a coin code to unlock online. no. if you havent noticed yet, Club Penguin just started putting that back on now. It is not a glitch. there is enough boxes for each room for a puffle? wow, theyre lucky! Lol, sounds like Valentine's Day at your house is pretty fun! We haven't even passed out Valentine cards to our family members yet... But yeah, I got a ton of chocolate! Like, a TON! I gave out king-sized packs of Sour Punch Straws to my classmates, and just some small candy to other peeps. I also have a ton left over for myself............ YUM! FEAST!! Year of the tiger? Cool! I was born the year of the tiger! That's awesome! its the year of the tiger? huh. i really need to catch up on stuff. OH NO! (srry for the caps) my homework! lol jk! I'm a good student. oh yeah, my cousin's b day was today on valentines and i went to the bday party. Hey mimo you should have another Webosaurs party. I love webosaurs now...A lot. I have been playing it for about six months now and am working with Turtle 140 and a couple other people on a really cool Webosaurs blog. Anyway ya have another Webosaurs party soon. (Make it at like 18 o'clock Webo time...Assuming that you are even considering doing this) :) See ya around mimo. Are you going to post about the new pin? Pink Puffle - iceberg, Yellow Puffle - lighthouse, Green Puffle - Beacon, White Puffle - Mine, Purple Puffle - Night Club, Blue Puffle - Forest, Black Puffle - The Pool. Although there is no box for the red puffle, it is probably in the Migrator. Maybe in future puffle parties Rockhopper will be here to celebrate the red puffle. jack inside of that lable is a coin code,i love them they're awesome. He can't see it because he doesn't own it yet! Thats a plastic coin. The plastic coins come with a lot of Club Penguin merchandise, and on the back they have a little piece of paper with a code on it. You can enter that code to get toys out of the treasure book. A Series 1 toy lets you get 2 items out of the Series 1 Treasure Book, a Series 2 toy lets you get 2 items out of the Series 2 Treasure Book, and so on. Because of the updates and Club Penguin crashing, that is part of a glitch that they have encountered, Every other penguin got that new sign too. Good observation ;) But it was like this last year, so us older penguins already knew there was gonna be a room for each puffle. Still, good observation. Nope, Mimo talked bout this, they brought it back :) I like it, its noticeable, sometimes I forget theres a new newspaper til after school LOL. nice toy! but i donno if i will get it..
Lol..i wish there is a chocolate rabbit(a real one)..it ould be really awesome! the water in the underground pool is drained! i can see invisible penguins in club penguin and i dont know why. is it a glitch? cya never wanna be ya! No it is not a glitch. Mimo already posted about that. Good eye to you though! Awwww, it's so cute! I want it! I just got my birthday money, I just have to wait till it comes out in the store. Sadly, no, but I did have a special Chinese New Year Muffin from my friend who celebrates it. Trust me, the muffin was delicious. Cool! I was born in the year of the ox, which supposedly means I'm stubborn. You guys don't think Im stubborn, right? Nope, not a glitch. They decided to bring it back. Mimo did a post on it. Yeah, Mimo already posted about that and it comes out every 15 minutes... good eyes though! You are right, but we didn't see the Migrator in the telescope and it usually takes Rockhopper about a week to come.... The red puffle's room will probably be in the cove! Yeah, me neither.. *** shoves ice pop in ear**** oww! I am going deaf because of your caps! Thand Goodness for Ice Pops! Nope that isnt a glitch. Club Penguin had the New sign on the newspaper before. Then they removed it. Now its back! Mimo even posted about it! Here is the info for the party and yes bobhead202 is my name. Thats nothing to freak out about. LOL. Its a coin code. When you get one you get coins and you will be able to unlock cool new stuff. Why is it a bunny? Why can't it be a platypus? Now THAT would be stylish! maybe it is actually a platypus in desguise... ok that was way too silly. lol. No this is not a glitch. CP brought the "new" back! I am glad about it too! Hey ppl! I'm commenting as Mimo is posting! Hey, Mimo on Wiglington and Wenks they gave everyone free 1000 credits (member money) now you can get a free member pet!! whooo!!!! There's a clothing item like that. Now I'm HUNGRY!!! Mimo, can i be a mod soon please? It is a bunny cause every easter there is a chocolate bunny costume for members. A platypus WOULD be cool, though! Actually CP brought it back! Cool huh? Ya, I know! Isn't it cool! Mimo knows, too! Awesome! The coin codes are so cool! No, I am not going to a party but I think next year is my animal! It would be cool if it was on RH's ship! That label is a coin code! write in the code on the club penguin screen to unlock cool stuff! Awsome! You might be right! Mimo has already noticed that but well done for noticing! Ow my ears just fell off ;)! No seriously don't put caps. And i think mimo already knows that cheat. But well done for noticing! I see your point but i think it should be a zebra! Maybe it says new because the paper came out late. Good to see you! And to introduce me to you my name is Dedgie02. Omg, I luv when that happens! Thanks! If I can't come, I hope lots of other people attend! Dude theres some lol bug so the penguin style thingy is the old number! its true! I actually have not had a rice cake in forever but they are yummalicious! I wonder what a rice cake would taste like with chocolate syrup...? Lol, I have a new thing on the grocery list for my mom! Oh, and Toys, don't use so many !'s! Sweet! Awesome! Great! Totally cool!...Um, can you give me another word, running out of them! Um, are you sure? I just checked it out, 5 syllables, 7, then 5. It looked perfectly haiku-ish to me! Actually, Mimo just did a Mod overhaul on...the 7th I think? So you will probably have to wait until next month. Good luck, and keep up your great Modding! Mimo already did. It is at the Beacon, on top of the green puffle box and it is a feather. Racet2000 is banned totally forever.`I called support and the ywouldn't let me have my account back, my new account is Racet200, I REPEAT: MY NEW ACCOUNT IS RACET200. I'm sorry but can you make my name as Racet200 instead of Racet2000. PS: I'm still out of town!! i think mimo already knows that. nice try though! I wanna be a mod plz mimo do a mod overhaul soon! well actually mimo found that out too. nice try though! Mimo! Please! I MUST be a mod! odd... maybe... hmmm. it is probably a glitch. lol! now you got me thinking about the tv show phineas and ferb. Ferb rocks! You too! I'm going to every party ever! Ok, maybe not. I didn't know it was the year of the Tiger! well first you have to work for it by answering peoples questions. whenever you answer their question, at the end of your comment, out your name with (CPG mod) next to it. hope that helps! he knows this and a lot of other ppl do too. Thanks anyway. Yes, good observation! That is where the black puffle ice rink will be! Ok, you may not have heard but Racet2000 (I call him Race) has been banned forever! A while ago actually, but still. He called CP but there was nothing they could do! So, now he will not be Racet2000, but Racet200. So...yeah. Just thought u should know. So if you see Racet200 in the comments, it is really Racet2000 with a new name! Inside the label is a coin with a code on the back so you can get on clubpenguin and unlock clothes, items, coins, and puffles too! If you look at Mimo's older posts you can see that he already told us that! But good job looking for clues around the island. Clubpenguin just recently started putting on the "NEW" signt on the newspaper! Mimo covered that in one of his older posts. So no, it is not a glich! I think he means the series thing where it shows all the penguins in the series. I wonder.... does mimo know something we dont? and is he not telling us? we'll find out soon. Congrats Fluffygood! you have to be fast to beat Mimo at finding stuff. No JD543 they did not stop doing that so it is not a glitch. Sorry. I hope I helped. It happened to me too. For all of you that are saying that Rockhopper will have may or may not be right. You know we havent seen him in the telescope or heard anything about it. On the other hand. No red puffle box. And who knows? Him and Safa153 are the quickest I think i've ever met. they are so good at alerting Mimo of things. The bunny is a teddy not a clothing item. Cool! I hope i get it for my bday! (My bday is on easter :) APRIL 4TH!!!!! 4/4 WOOHOO!!!! WOOT! Happy birthday in advance! uhmm..i know it's out of the subject but...i'm a puffle lover and i want to know; does the puffle washer work? or its a display? It's a toy and it gives them a bath! i got it today (2-28-10) and i can't log it on it says (this catalog has not come out yet) so i guess it is in the 7th book awesome!